We’re excited to announce the inclusion of Digital Dental Radiographs in our Comprehensive Dental Evaluation and Treatment! Intra-oral radiographs are made using small radiographic or digital sensors placed inside a patient’s mouth and provide superior quality for examination of individual teeth or sections of the jaws compared with the standard-sized veterinary radiographs. 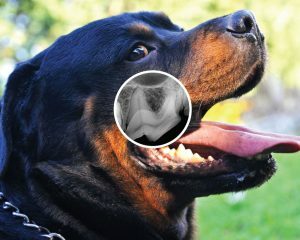 Dental radiographs are an invaluable tool in assessing the health and viability of your pet’s teeth and they allow the internal anatomy of the teeth, the roots, and the bone that surrounds the roots to be examined. More than 50% of the tooth lies underneath the gums and cannot be visualized, which makes dental radiography an important part of our dental evaluation and treatment. Read out FAQ blog here.